Planning a group visit to Great Lakes Science Center? Groups of 10 or more receive substantial discounts off box office ticket prices all year long. Choose from admission to the following: Science Center/NASA Glenn Visitor Center only, the Cleveland Clinic DOME Theater only, the Steamship William G. Mather only or a combined admission, all at discounted rates. For more information on group packages or to make a reservation, call 216-621-2400, fax 216-696-2142 or email edhelp@glsc.org. Discounted admission is available to groups of 10 or more. Coupons, passes or membership discounts do not apply to the group rate. We require reservations and full payment at least two weeks in advance of your visit. We offer free admission to tour operators and bus drivers. One chaperone is required for every seven youths. Includes general admission to Great Lakes Science Center, theSteamship William G. Mather and one Cleveland Clinic DOME Theater film. Choose any two attractions: General Admission, the SteamshipWilliam G. Mather or one Cleveland Clinic DOME Theater film. Includes general admission to Great Lakes Science Center exhibits and NASA Glenn Visitor Center as well as space to eat lunch. Also includes admission to current traveling exhibition (when available). Includes admission to one Cleveland Clinic DOME Theater film. Includes admission to Steamship Mather (open seasonally May – October). Groups consisting of adults 65 years of age and older are eligible to receive $1 off adult group admission prices for general admission and combo tickets. Two great museums! One great price! See two of Cleveland's must-see attractions – Great Lakes Science Center and the Rock & Roll Hall of Fame on the same day. Groups of 10 or more are eligible for group rates. Ticket prices are per person and include admission to both attractions and complimentary tickets for tour directors, drivers and adult chaperones at a ratio of 1:10. Lunch is not included in the package price. Your group of 10 or more guests can tour the Rock & Roll Hall of Fame and the Great Lakes Science Center in the morning or afternoon. 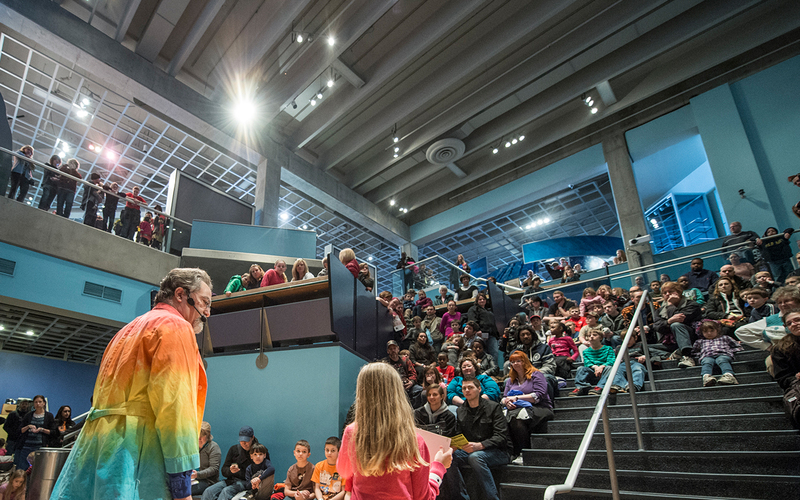 Great Lakes Science Center requires one adult chaperone for every five youth. Chaperones within the one-to-five ratio receive reduced rates off the normal adult group rates. Any additional adults are subject to regular group pricing. Chaperones are responsible for the behavior and safety of their youth. We reserve the right to eject groups or group members who are disruptive to other guests or do not follow Great Lakes Science Center safety regulations or rules. We offer a number of attractive and affordable discount packages for groups of 10 or more. Get details. Reservations are required in order to receive discounted group pricing. Call 216-621-2400 (Monday - Friday) to book your group visit. A confirmation will be sent immediately following the completion of your reservation. Please review your confirmation carefully to be sure that you have everything you need to make your visit an enjoyable experience. Please sign and return your confirmation and payment information at least 14 days prior to your visit. Full payment and final group numbers must be received at least 14 business days in advance of your trip. Great Lakes Science Center accepts purchase orders, checks, major credit cards and cash. Changes made to your reservation less than 14 days of your visit cannot be guaranteed. Cancellations must be made at least 14 days in advance of your trip. If you must cancel, send a written cancellation within 14 days in advance of your visit by email to edhelp@glsc.org, by fax at 216-696-2142 or by mail to Great Lakes Science Center, 601 Erieside Ave., Cleveland, OH 44114. Telephone cancellations cannot be guaranteed. Great Lakes Science Center has a no-refund policy. Every effort will be made to reschedule groups, subject to availability. Failure to return the confirmation form does not constitute a cancellation and all fees will apply. If your group is delayed on the day of your visit, please call 216-621-2400. We will do our best to accommodate late arrivals. Please note, however, that late entry into the DOME Theater is not permitted. Pre-ordered lunches – Enjoy the convenience of a pre-ordered lunch. Choose sandwiches, wraps, beverages and more. When you call to make your reservation, please be sure to let our reservations agent know that you are interested in pre-ordering lunches. A menu and order form, with our delicious options, will be included in your pre-visit information packet. See lunch order form. To make lunch arrangements, call Levy at 216-696-4481. Brown bag lunches - As space permits, your group can enjoy their lunch “picnic style” at the Science Center. Weather permitting, groups are welcome to dine outdoors along the harbor. Please let a reservations agent know at the time of booking if you plan to eat lunch at the Science Center. Prior to your visit, please label each lunch and pack all lunches in a large box (provided by you) with the group’s name clearly written on each box. Upon your arrival, you will receive specific storage information from a staff member. Great Lakes Science Center is located at 601 Erieside Avenuein downtown Cleveland, Ohio between the Rock and Roll Hall of Fame and Museum and the FirstEnergy Stadium. From the South - Take I-77 North to the East 9th Street exit and stay to your right. Take East 9th Street North. Turn left onto Erieside Avenue. From the East - Take I-90 West (Route 2) to the East 9th Street exit. Turn right on East 9th Street and take an immediate left onto Erieside Avenue. From the West - Take I-90 East to East 9th Street exit. Turn left on East 9th Street. Turn left onto Erieside Avenue. Buses - Paid parking is available in the Port Authority lot north of Cleveland Browns stadium. For groups visiting the Science Center, the rate for charter buses is $20. The rate for school buses is $10. Our staff will direct drivers. Cars and other vehicles - All vehicles under 6'10” may park at the Great Lakes Science Center Parking Garage for a discounted fee with validated ticket. Vehicles are not permitted in the driveway unless they are for physically handicapped visitors. Call 216-696-4338 for more information. Prices are subject to change.